Confirmation is the Sacrament in which one is enriched by the gift of the Holy Spirit and bound more perfectly to Christ and to His Church. It strengthens us and obliges us to be witnesses to Christ by word and deed and to spread and defend the faith. It is the Sacrament in which one enters into full membership in the Catholic Church. 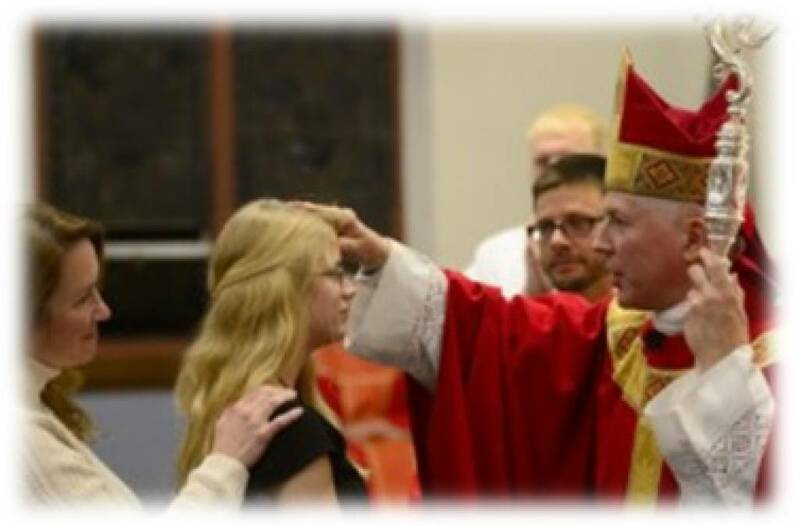 Confirmation perfects Baptismal grace; it is the sacrament which gives us the Holy Spirit in order to root us more deeply as children of God, incorporate us more firmly into Christ, strengthen our bond with the Church, associate us more closely with her mission, and help us to bear witness to the Christian faith in words accompanied by deeds. Confirmation, like Baptism, imprints a spiritual mark or indelible character on the Christian soul; for this reason one can receive this sacrament only once. A Christian does not live as a child of God through his or her own efforts alone, but through the grace of God. It is our duty to seek the grace that God offers us, through His Sacraments in order to live our lives as Christians in the way that God intends. For St. Joseph and Saint Ann parishes, Confirmation preparation will normally begin in 7th Grade. 7th Graders will begin by involving themselves in service hours, selecting a Confirmation Name, and selecting a qualified sponsor. The final selections mentioned will be used during the 8th Grade preparation year. Click here to open our Confirmation Information Booklet. Click here for 2018-2019 7th Grade Confirmation Prep Important Dates. Click here for 2018-2019 8th Grade Confirmation Important Dates. Click Here to document Confirmation Works of Mercy (online Google form).